In the Cell Membrane unit we will learn that the cell membrane is one of the great multi-taskers of biology. It provides structure for the cell, protects cytosolic contents from the environment, and allows cells to act as specialized units. We will also learn that the membrane is the cell’s interface with the rest of the world - it’s gatekeeper. This phospholipid bilayer determines what molecules can move into or out of the cell, and so is in large part responsible for maintaining the delicate homeostasis of each cell. ​Membranes control the composition of cells by active and passive transport. Explain the need to control variables in experimental design. Explain two examples of simple diffusion of molecules into and out of cells. Explain one example of active transport of molecules into and out of cells through protein pumps. Diffusion is the passive movement (does not require energy) of particles from a region of high concentration to a region of low concentration. Passive transport means there is no expenditure of energy (ATP). Passive transport requires the substance to move from an area of high concentration to low concentration. Osmosis - the passive movement of water molecules, across a semi-permeable membrane, from a region of lower solute concentration to a region of higher solute concentration. Simple diffusion - passive movement of particles from an area of high concentration to an area of low concentration (follows its concentration gradient). Simple diffusion across membranes occurs when substances other than water move across the phospholipid bilayer (between the phospholipids) or through protein channels. Substances that move across the membrane are usually small non-charged particles (i.e. Oxygen, Carbon Dioxide, and Nitrogen) or other lipids. During facilitated diffusion the membrane protein changes its shape to allow a specific substance to move across the membrane. Each protein channel structure allows only one specific molecule to pass through the channel. For example, magnesium ions pass through a channel protein specific to magnesium ions. 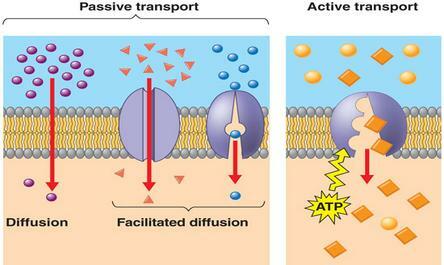 Active transport - movement of substances across membranes using energy from ATP. Active transport generally moves substances against their concentration gradient (low to high concentration). Many different protein pumps are used for active transport. Each pump only transports a particular substance; therefore cells can control what is absorbed and what is expelled. Pumps work in a specific direction; substances enter only on one side and exit through the other side. Substances enter the pump from the side with a lower concentration. 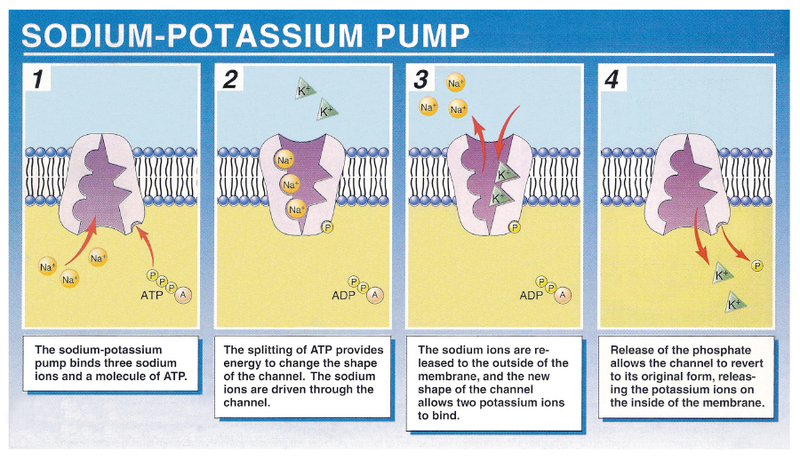 Energy from ATP is used to change the conformational shape of the pump. The specific particle is released on the side with a higher concentration and the pump returns to its original shape. ​Outline two examples of materials released from a cell via exocytosis. Plasma membrane is pinched as a result of the membrane changing shape. External material (i.e. Fluid droplets) are engulfed and enclosed by the membrane. A vesicle is formed that contains the enclosed particles or fluid droplets, now moves into the cytoplasm. The plasma membrane easily reattaches at the ends that were pinched because of the fluidity of the membrane. Vesicles that move through the cytoplasm are broken down and dissolve into the cytoplasm. 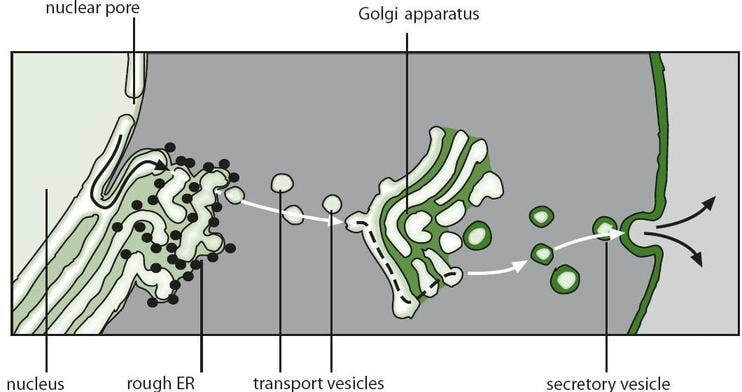 After a vesicle created by the rough ER enters the Golgi apparatus, it is again modified, and another vesicle is budded from the end of the Golgi apparatus, which moves towards the cell membrane. This vesicle migrates to the plasma membrane and fuses with the membrane, releasing the protein outside the cell through a process called exocytosis. The fluidity of the hydrophilic and hydrophobic properties of the phospholipids and the fluidity of the membrane allows the phospholipids from the vesicle to combine to the plasma membrane to form a new membrane that includes the phospholipids from the vesicle. 1.4.U3: Vesicles move materials within cells (Oxford Biology Course Companion page 34). Outline how phospholipids and membrane bound proteins are synthesized and transported to the cell membrane. After proteins have been synthesized by ribosomes they are transported to the rough endoplasmic reticulum where they can be modified. Vesicles carrying the protein then bud off the rough endoplasmic reticulum and are transported to the Golgi apparatus to be further modified. After this the vesicles carrying the protein bud off the Golgi apparatus and carry the protein to the plasma membrane. 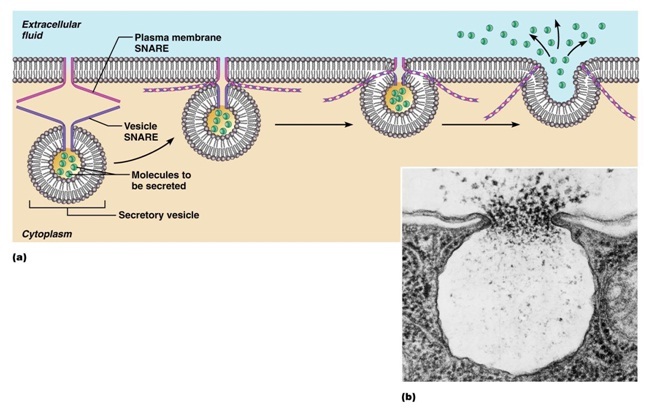 Here the vesicles fuse with the membrane expelling their content (the modified proteins) outside the cell. The membrane then goes back to its original state. This is a process called exocytosis. Endocytosis is a similar process which involves the pulling of the plasma membrane inwards so that the pinching off of a vesicle from the plasma membrane occurs and then this vesicle can carry its content anywhere in the cell. 1.4.A.1 Structure and function of sodium–potassium pumps for active transport and potassium channels for facilitated diffusion in axons. Describe the action of the “voltage gate” of the potassium channel. An integral protein that exchanges 3 sodium ions out of cell with two potassium ions into the cell. Outline the use of normal saline in medical procedures. Hypertonic solution – Is a solution with a higher osmolarity (higher solute concentration) then the other solution. If cells are placed into a hypertonic solution, water will leave the cell causing the cytoplasm’s volume to shrink and thereby forming indentations in the cell membrane. Hypotonic solution – Is a solution with a lower osmolarity (lower solute concentration) then the other solution. 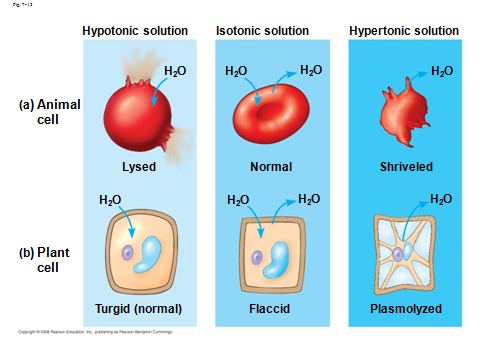 If cells are placed in a hypotonic solution, the water will rush into the cell causing them to swell and possibly burst. 1.4.S.1 Estimation of osmolarity in tissues by bathing samples in hypotonic and hypertonic solutions. (Oxford Biology Course Companion page 41). Determine osmolarity of a sample given changes in mass when placed in solutions of various tonicities. ​Explore the types of passive and active cell transport with the Amoeba Sisters! Transport types covered include simple diffusion, facilitated diffusion, endocytosis, and exocytosis. ​Paul Andersen describes how cells move materials across the cell membrane. All movement can be classified as passive or active. Passive transport, like diffusion, requires no energy as particles move along their gradient. Active transport requires additional energy as particles move against their gradient. Specific examples, like GLUT and the Na/K pump are included.